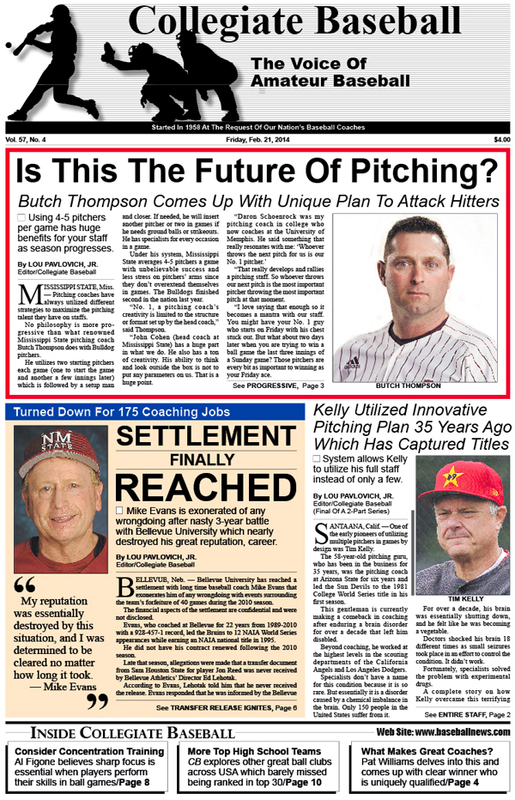 • Mississippi State pitching coach Butch Thompson explains how his futuristic plan for utilizing 4-5 pitchers per game might change the traditional thinking of how to manage a pitching staff at the collegiate level. • In part two of former ASU pitching coach and pro scout Tim Kelly’s story, he explains how his management of pitchers, similar to Butch Thompson’s, helped Arizona State win the 1981 College World Series. • After a three year battle, former Bellevue University Head Coach Mike Evans has been exonerated through a recent out-of-court settlement over allegations concerning the eligibility of a player. Bellevue was forced to forfeit 40 games in 2010 which cost them a berth to the NAIA tournament and caused Evans to lose his job. • Editorial: Everyone in baseball should be concerned about the decline of black players at all levels of the game. • What techniques are utilized by elite baseball coaches in the game? • Abe Chanin, founding publisher of Collegiate Baseball, dies at age 92. • College Notes: Southern Arkansas OF Jackson McCurdy hits for the cycle in the season opener. • Baseball Factory announces the first 10 players for the 2014 Under Armour All-American Baseball Game. • Al Figone discusses precision concentration and how critical it is for coaches to teach this important concept for players to reach their potential. • High school players planning to move on to college must develop a precise plan for getting recruited. • Collegiate Baseball takes its annual state-by-state look at elite 2014 high school teams across the USA. • Rules Consultant Rich Marazzi continues his look at thought provoking plays from the 2013 Major League season. • Special drills can help middle infielders execute double plays with more consistency. • Justin Dehmer and Amy Snow discuss the BASE2 Relationship System to aid coaches in measuring how they are doing at building trust with their players. • Special tests can help coaches detect if players are voice, touch or written word learners so teaching can be more effective to all players. • Charlie Greene discusses how pitchers can learn to throw properly on defensive plays without making costly errors.